There’s a picture of a boy in a pinstripe suit standing on top of a chair in the famous Savoy Ballroom in Harlem, New York. He’s leaning against the shoulders of another young man to watch a performance onstage. America is still in the throngs of the Great Depression. Teenagers and adults are looking for ways to express themselves despite their poverty, uncertainty, and despair. An attitude develops among them, one that is rebellious, frenetic, and suspicious of authority. The sound of big jazz animates their footsteps as they parade the streets, hanging around bars and clubs, letting the thrills of Harlem’s nightlife be their compass. They develop a subculture, which spreads across the country and among young people around the world who treat fashion and jazz as a means of survival. For them, style is an expression of the strength and fluidity communicated through the cut and color of a particular suit. The zoot suit. To those who studied youth culture in the 1930s and ’40s, the zoot suit was seen as a response to broader political and economic changes within society and a recycling of fashion trends. During the Great Depression, clothiers were hit hard by the lack of disposable income available to American families. Women and children were forced to scale back on items of clothing to allow men to purchase makeshift suits, without splurging on accessories like hats and vests. Manufacturers in menswear needed to develop fashionable items of clothing that would allow their male clientele to make an impression while owning a durable and inexpensive working uniform. Peiss writes that the arrival of the zoot suit could also be read as a reaction to the muted forms of male dress that were ushered in by “the Great Male Renunciation.” Coined by English psychologist J. C. Flügel in 1930, the term refers to the tempering of male fashion that arrived during the American and French Revolutions, the Protestant Reformation, and the development of trade industries. In The Cut of His Coat: Men, Dress, and Consumer Culture in Britain, 1860–1914, scholar Brent Shannon states that the elaborate and ostentatious styling were greeted with hostility and disdain because they were associated with aristocratic elites who used clothing and accessories to communicate their class and rank to those they deemed beneath them. And as the zoot suit became a prominent feature among young black men, famous musicians and figures began to adopt the garment as a signifier of the times. In The Autobiography of Malcolm X, the activist describes the first electric-blue zoot suit he bought as a listless teenager roaming the streets of Roxbury, Boston. The exuberant jazz musician and band leader Cab Calloway performed “Geechy Joe” in the film Stormy Weather (1943), wearing a handsome white zoot suit with a dangling gold-plated chain and an imperial hat finished off with a feather. 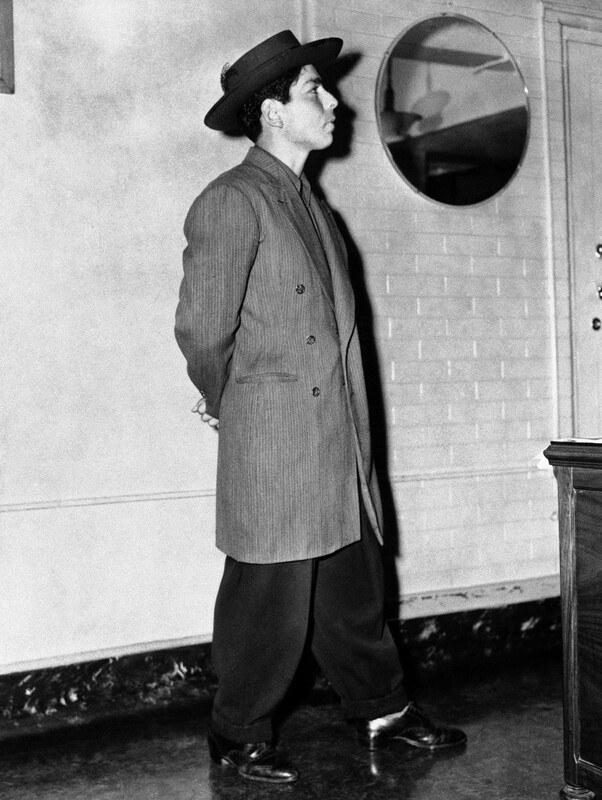 The tensions surrounding the zoot suit culminated in the Zoot Suit Riots of 1943. On June 3, a group of 50 sailors based at the Naval Reserve Training School in Los Angeles assaulted a number of Mexican American zoot suiters, infiltrating their communities and attacking whoever donned the garment. Sailors tore off the zoot suits of these men, urinated on them, and torched them in the streets. A local newspaper reported that even Mexican Americans who weren’t wearing zoot suits were targeted by the sailors who spent days going after anyone deemed a threat to American values and patriotism. While the sailors were the perpetrators of the violence, few of them were arrested, and the media worked to depict them as vigilantes waging a war against alleged delinquency and crime. On the other hand, hundreds of mainly Mexican American men were arrested and thrown into jail for violating the measures imposed by the WPB. On June 8, the Los Angeles City Council outlawed the wearing of zoot suits. As the riots came to a close, California governor Earl Warren looked into the causes of the Zoot Suit Riots and determined that, while many issues had fueled the outpouring of violence, discrimination against Mexican Americans and prejudice from newspapers and the Los Angeles Police Department were factors that explained how the violence escalated. However the zoot suit was viewed following the riots in 1943, the garment outlasted the controversy by which it was briefly defined. Toward the end of the war, manufacturers had found ways to get around the WPB’s restrictions to sell suits that were “less zooty but more drapey.” And when the bans were removed as the Allied forces defeated the Nazis, the zoot suit was allowed to return to the streets, where it found its home and popularity. As the decades rolled on, new subcultures such as the beatniks, mods, hippies, and rockers established their own ways of rebelling against the system through messing with traditional ideas of cut, color, and style. 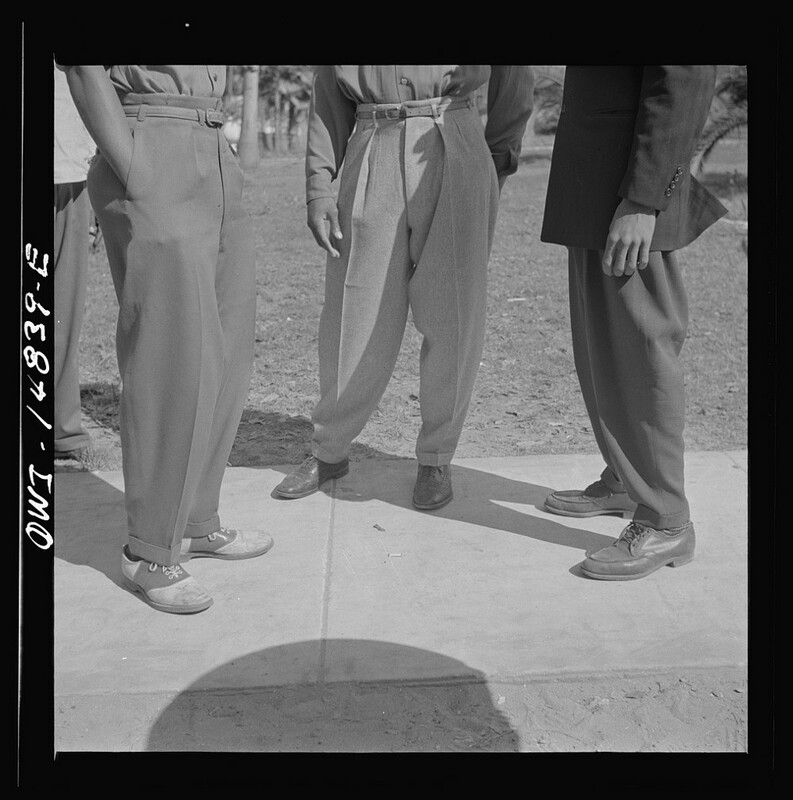 And while the zoot suit may have become a relic of the past until it was reappropriated as part of the swing revival during the nostalgic 1990s, it paved the way for disenfranchised young people to use fashion as a form of defiance and flamboyance in a world where those two things were seen as the enemy of bourgeois conformity.